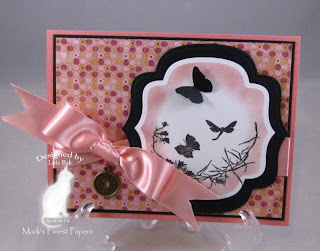 Faith wanted us to include a butterfly, a flower, and a die-cut in our card this week. I may have gone a little overboard – I have a butterfly, three flowers and four die-cuts. Actually, there are two butterflies because the punched-out one is covering a stamped one. 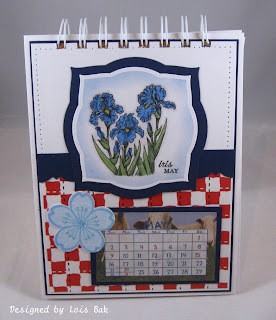 I love the Spellbinders Fleur de Lis shapabilities – so much that I used it twice. The image, from Mark’s Finest Papers Presents: Serenity Collection, was stamped and then cut out using a circle nestie, matted in black. The punched-out butterfly looked a little plain, so I added a couple of small pearls. I had originally used a punch to create the flowers but I didn’t like the way it looked, so I used the Primas instead. As you can see, I used Joanne’s (jojot) favorite color combination. 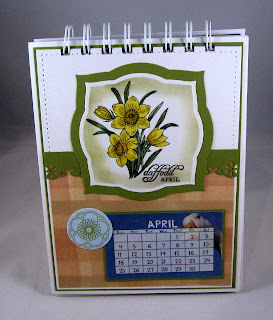 Stamp (main image), cardstock, and Spellbinders are all available at Mark's Finest Papers. 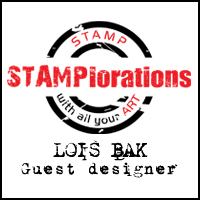 Joanne (our lover of lighthouses) was the hostess this week for the Stampin'B's DT Challenge Blog. She wanted us to do a nautical card – anything with boats, shells, lighthouses, etc., etc., etc. I had bought an economy set of stamps from A.C. Moore before they closed their Orlando store – with shells and lighthouses. 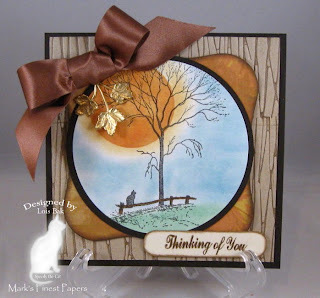 I especially liked this image, which I stamped with Palette Burnt Umber and colored with Copic and Prismcolor markers. 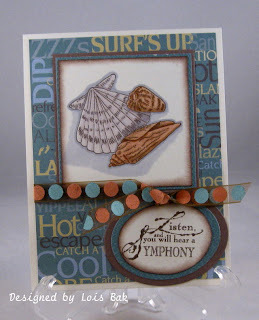 The sentiment is from a set of nautical stamps from Impression Obsession, and I thought it would work well with the shells. After searching through my drawer full of blue paper, I found this Cloud 9 paper with all sorts of nautical sayings on it – it provided me with my color combo. 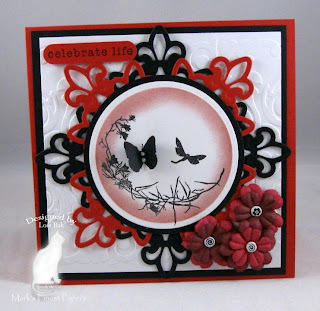 Stef's choice for the Inspiration Challenge this week was a winner! After looking through several of the sections, I honed in on this set of botanical prints -- choosing only three for my card. All coloring is done with markers, with some sponging around the edges of the "frames" with Creamy Caramel. The stamps came from various SU and other sets -- Both Way Blossoms, Butterfly of Happiness, and others. The dragonfly is actually only one part of a collage by Inkadinkadoo. After watching Sherry Cheever's (BadSherry) tutorial during the Spellbinders Surprise Party, I just had to try that technique. I Googled "vintage easter" to find a picture I could use for this card. Using five of the six Labels Four dies, I cut out pieces of the downloaded picture -- stacking them up using big pop dots. The DP is from Basic Grey's Eskimo Kisses DP pad. I added some ribbon and a cross charm. Thanks so much, Sherry, for a great technique. It was not as difficult as I had anticipated, and I do believe this will not be the only card I make using it! My cards for Day Three of the Mark’s Finest Papers DT Blog Hop come from another Mark’s Finest Papers Presents: Speedy the Cat Collection, which are now available in the store. The set I used today is called Our Family Tree. First, let me say that I LOVE this tree! And there’s Speedy himself sitting on the fence! Before stamping the image I punched a circle in a Post-It note, placed it on the Snow Storm White, and sponged Palette Cognac and Orangerie in inside the circle to create my Harvest Moon. After removing the Post-It, I sponged some more of the Cognac around the outside of the moon. Then I stamped the tree with Palette Noir. I didn’t want the sky or grass to appear too bold, so I used some Pebbles pearlescent chalks. 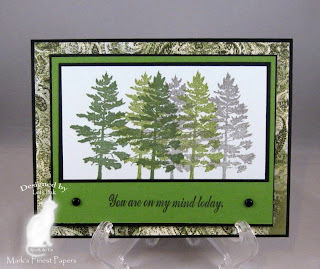 The background piece was created using an inked-up Forest Branches Cuttlebug embossing folder. I had to run it through the CB twice because the cardstock was a little wider than the folder. I sponged the Labels One piece with Palette Burnt Umber to give the illusion of another layer. A little ribbon, a pretty charm, and a sentiment finished it off. 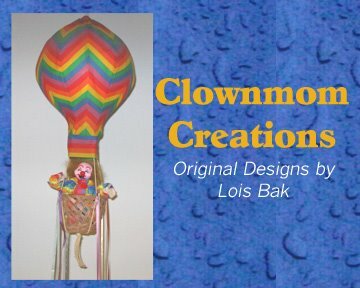 My second card came together very quickly -- mainly because it's a very simple card. The double trees were stamped with Palette Charcoal, Landscape and Jardin Moss on MFP Yum Yum’s Blue Eyes cardstock – then matted in Speedy the Cat black, mounted on MFP Spring Leaf, and matted again in black. The background is from Basic Grey Boxer DP. I think it took less than ten minutes to complete. 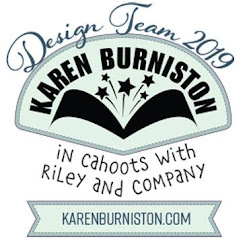 Don’t forget -- For your chance to win BLOG CANDY, visit and comment on each of the following design team members' blogs on January 13th, 14th and 15th. 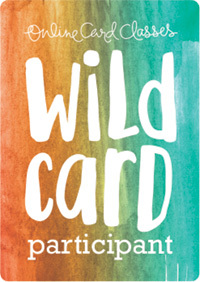 Then, on Saturday, (January 16th), a winner will be chosen from those who have visited all 8 blogs all three days. The winner will be announced on the Mark's Finest Papers Blog and will receive 2 Stamp Sets that will be released NEXT month. And remember, Friday night will be the New Flourishes Release at Mark's Finest Papers! 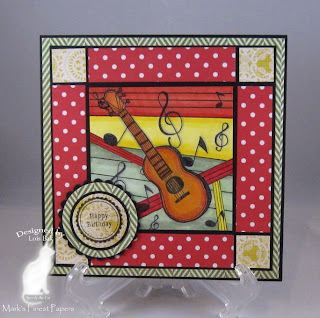 My cards for Day Two of the Mark’s Finest Papers DT Blog Hop come from the Mark’s Finest Papers Presents: Serentity Collection, which are now available in the store. The first one is made with Shadows of Memories. I stamped the image in Palette Noir cut it out with a Nestabilities Labels Nine die, and sponged with Palette L’Amore Red before removing the die. I then matted it with Speedy the Cat Black and added a punched-out butterfly. After matting a piece of Basic Grey Lemonade DP with black, I added a ribbon and an oriental charm. My second card is a little less feminine. Cards for men are always a challenge to me. The image, from the Whispers of Dreams set, is stamped with Palette Noir on a piece of DP from the Basic Grey Indian Summer DP pad and then matted in black. If you work fast, you can emboss with the Palette inks – which I did with clear embossing powder. One of the pages in that pad has a funky striped pattern, which I cut along the curved line and used on the bottom of the background. Something I like about these two Serenity sets is the fact that there are several very nice, Confucius-like sentiments included with each set. 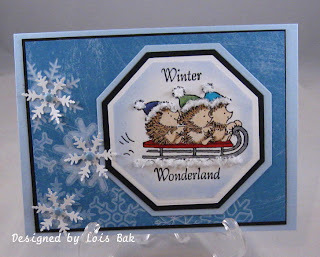 If this Stampin’B’s challenge had been posted a few days ago, my card could have been appropriate even for us Florida folks! It was COLD!!! There even were reports of snow flurries!!! Nicole asked us to make a card showing winter fun (skating, sledding, skiing). I chose sledding. I love these little Penny Black hedgehogs. 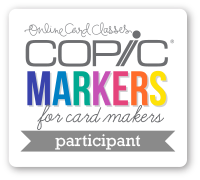 After stamping them with Versafine Black Onyx and clear embossing, I colored them with Copic markers and cut them out with the octagonal nesties, which are fast becoming a favorite of mine. As I didn’t want this card necessarily to be a Christmas card, you will note that their hats are not red. I added some Polar White Flower Soft for the fur on their hats and snow under the toboggan. To accent the snowflakes on the DCWV background paper, I punched out some snowflakes and attached them with brads. I certainly hope we don’t have any more of the frigid weather we experienced over the past several weeks. That’s not why I moved to Florida! But the hedgies sure look like they’re enjoying it! 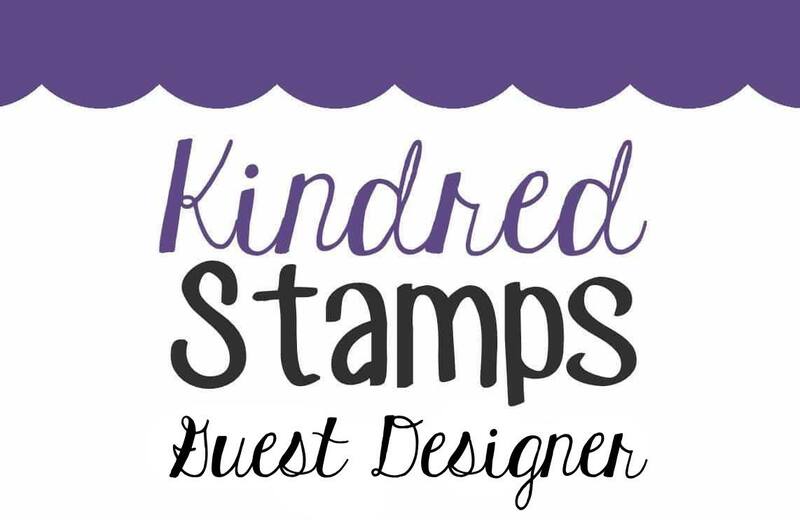 Mark's Finest Papers Design Team is celebrating our BRAND NEW Speedy the Cat Designer Collection and Serenity Collection Stamps with a Blog Hop! You can ORDER THEM TODAY! For your chance to win BLOG CANDY, visit and comment on each of the design team members' blogs on January 13th, 14th and 15th. Then, on Saturday, (January 16th), a winner will be chosen from those who have visited all 8 blogs all three days. The winner will be announced on the Mark's Finest Papers Blog and will receive 2 Stamp Sets that will be released NEXT month. And remember, Friday night will be the New Flourishes Release at Mark's Finest Papers! I’ve been looking at the tutorial for the mosaic technique on SCS for some time now and wanted to give it a try. 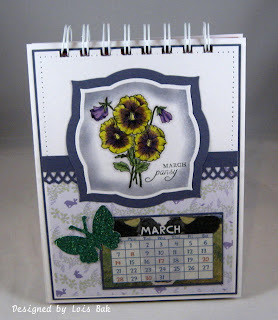 So I decided that my first card for this month’s MFP Blog Hop would be a mosaic. After stamping the Sunflower with Palette Burnt Umber on Snow Storm White, coloring it with Copic markers and cutting it out using the Labels One Nestabilities, I followed the instructions from the tutorial (stamp it with Versamark and clear emboss – then rub the darker color over everything, and wipe it off). I kind of like the look it gives. 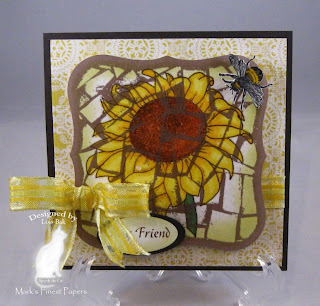 The sentiment is part of the sunflower stamp, so I just restamped that part and cut it out using Petite Oval Nestabilities, popping it up over the original words. The little bee is stamped, colored, cut out and then covered with Crystal Effects to give it a shiny look. 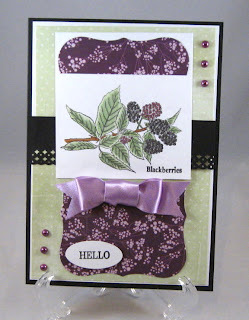 My second card was made using the Blackberries stamp from the same MFP set. I found the layout on Page Maps, a great site for card layouts. The blackberries image was stamped with Palette Noir Black and colored with Copic markers. I cut the Labels One diecut into two pieces. With the blackberries image in the middle, it gives the illusion of a much longer diecut. 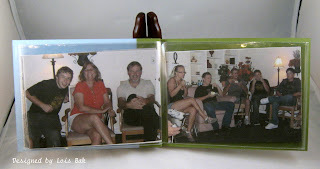 The punched border piece allowed me to cut the Basic Grey DP into two pieces to fit the larger 5 x 7 size of my card. 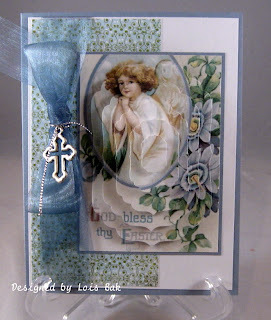 I added a few Basic Grey half pearls and some pretty ribbon, along with the sentiment – and I was done. 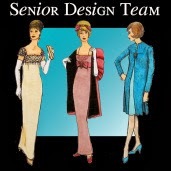 Be sure to check out all the cards created by the rest of the Design Team, making sure you comment on each blog so you will have a chance at winning the two new stamp sets. 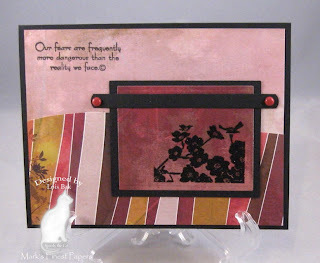 Today's Featured Stamper on SCS was WeeBeeStampin. 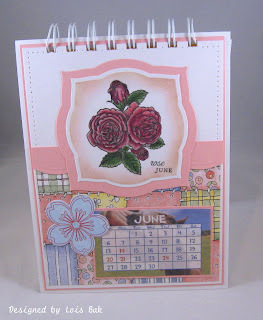 After looking through Wendy's gallery, I found this card, which had the perfect layout for my calendar project. 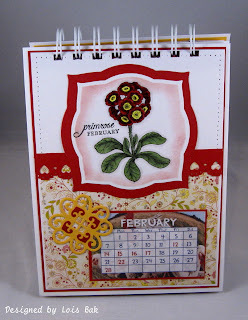 Using Flourishes Calendar Sets, I have completed six pages of my calendar. Because they will be back-to-front mounted, I was able to construct the calendar, even though the last six pages have not been stamped. 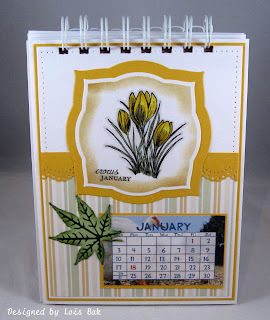 I used a small calendar I picked up at Michaels in their $1 rack. All of the images are cut out using Nestabilities Labels Three. All coloring is done with Copic and Prismacolor markers. Hopefully, I will be able to complete my calendar tomorrow. This will serve as my office calendar. And I'm thinking that I can replace the calendar sheets next year and use it over again. The Flourishes pre-release challenge is to show some love. I do love Flourishes stamps and alcohol markers. I hope that is enough to qualify for this challenge. 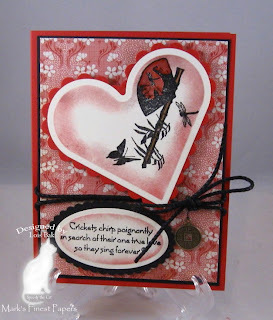 I made this card for Sharon Johnson's (notimetostamp) Stamp Simply Challenge ssnotime121, which was to use a heart or love theme on your card. I'm using a soon-to-be released set called Shadows of Memories over at Mark's Finest Papers. I stamped the image using Palette Noir Black, colored it with Copic markers, and then cut it out at an angle to mimic the side of the heart. It's hard to see but I used a clear glitter pen on the wings of the dragonflies and on the butterfly. 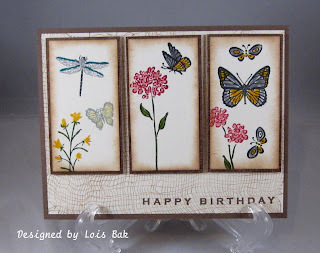 Sponging on both panels help to accent the stamping. I added some twine and an oriental charm to finish it off. I'm loving those charms that Faith has in her store. Both the heart and the oval are popped up on dimensionals so that the twine can go underneath of them. All supplies are available at Mark's Finest Papers. 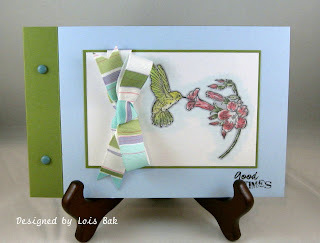 Vicky Gould was hostess for the Stampin'B's DT Challenge Blog this week. Her challenge of a Clear Envelope Brag Book really made me think. I had never done one of these before, so I had to look up the directions in the Resource section of SCS. The cover wasn’t hard. I stamped the image and colored it with Copic markers. After matting it with the green, I tied a ribbon around it. I followed the tutorial and made the cover. The sentiment is a rub-on from 7 Gypsies, available at Mark’s Finest Papers. It was then that I realized I didn’t have any clear envelopes. So I decided to save the packaging from several clear stamps and use the clear outside envelopes for the inside of my Brag Book. They were just a little long so I had to cut them down a bit, but they worked. I am going to give this to my mom. 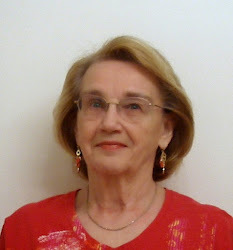 The photos inside were taken at her 90th birthday. The first photo is my grandson Deylan, my niece Laura, and my son Scott, who drove down from Alabama for the party. The other photo is my niece's daughter-in-law Tamra, Laura's son Cory, Laura's husband Lloyd, Deylan again, and my son Doug's stepson Robby. My 89-year old uncle (my mom's brother) drove up from Naples, which was a surprise. We had a total of 20 people (four generations) in the library of the assisted living facility where my mom lives for the party. Today's Inspiration Challenge website on SCS was Design Spirit Studios, with all its funky clocks and jewelry. After looking through all the great items, I honed in on this Guitar Magnet Clock. It's funny, I've had this Heartfelt Creations set for about a year, having never inked it up; and now I've used it twice in three days -- first time with a trumpet, this time with a guitar. I stamped and then masked the guitar before stamping the background over (or rather, behind it). 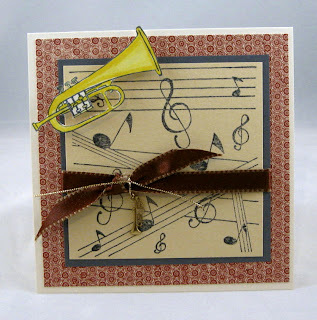 With the exception of the red/white polka dot paper, the DP is from Basic Grey.This also qualifies for this week's Crazy 4 Challenges challenge -- to use polka dots on your card. Cardstock, Basic Grey DP, and Palette ink available at Mark's Finest Papers. The charm is available at Mark’s Finest Papers.